The US Senate has overwhelmingly rejected plans to transfer detainees out of Guantanamo Bay and refused funding to close down the prison camp. Senators voted by 90-6 to block the transfer of 240 inmates, also stalling a request for $80m (£51m). Correspondents say it is a rebuke to President Barack Obama's plans to close down the camp by January 2010. The White House said Mr Obama would not make any decision that "imperils the safety of the American people". The president had not decided where some of the detainees would be sent and a presidential commission was studying the issue, press secretary Robert Gibbs added. The Senate decision to block a war funding bill meant for the camp followed a similar decision by the House of Representatives. 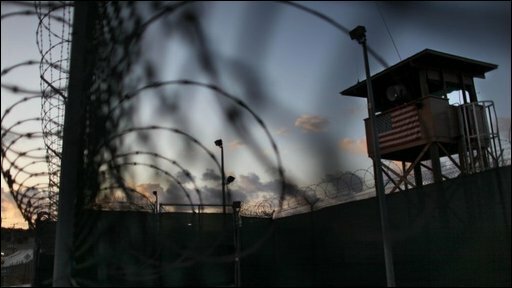 Democrats and Republicans each argue that there needs to be a better plan for closing Guantanamo, situated on US territory on the island of Cuba. The detention centre was established after the 9/11 attacks by the then President, George W Bush. Obama administration officials insist the deadline for closing the camp will be met but many legislators say they need further convincing of White House plans to move many of the detainees on to the US mainland. "The American people don't want these men walking the streets of America's neighbourhoods," Republican Senator John Thune said. "The American people don't want these detainees held at a military base or federal prison in their backyard, either." The Republican leader in the Senate, Mitch McConnell, said the White House needed a credible plan for closing the base. "Once it has one, we'll consider closing Guantanamo, but not a second sooner," he said. Democratic leaders say they will reconsider providing the requested funds once the White House has drawn up more detailed plans. Most Democrats support Mr Obama's commitment to close Guantanamo Bay, but realise that agreeing to fund an ill-prepared process would provide fodder for the Republican opposition, says the BBC's James Coomarasamy in Washington. The new setback follows Mr Obama's decision to revive the military tribunal system for some Guantanamo detainees. In one of his first acts on taking office, he halted the Bush-era military commissions, saying the US was entering a new era of respecting human rights. Introducing new safeguards for detainees, he said he had supported their use as one avenue to try detainees and in 2006 had voted in favour of them.